April 28th, 2017 – GRAITEC, an international BIM and CAD software developer for AEC, and Autodesk® Platinum Partner in US and across Europe, is delighted to announce the launch of Advance PowerPack for Autodesk® Revit® 2018, compatible with both Autodesk® Revit® 2017 and 2018. 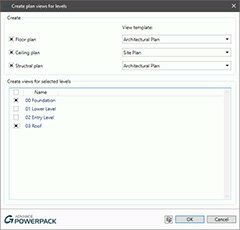 GRAITEC is constantly improving its products to provide first-rate productivity tools for its valued customers, and the recent launch of the PowerPack for Autodesk® Revit® 2018 is no exception to this rule, as it delivers a set of new powerful tools, as well as several improvements to the existing toolset to help boost productivity in Revit®. 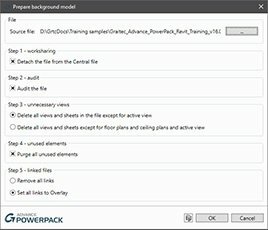 In version 2018 of the PowerPack, cleaning up your architectural background files before linking them to structural or MEP models has never been easier with the new Prepare Background Model command in the Files group. 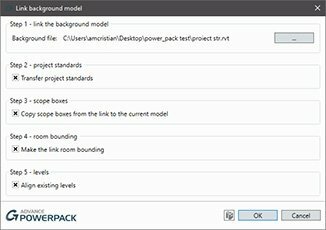 The Link Background Model function is another powerful new tool, that links the architectural background file in the MEP or Structural model, allows users to transfer project standards from the linked file, enables copying scope boxes from the background file and make the link room-bounding. The third new addition to the Files group is the Create Views command, which rapidly and efficiently creates views based on view templates, allowing multiple levels/view templates selection. One of the major changes in this version is the migration of the Reinforcement panel from PowerPack for Revit ribbon to the Reinforced Concrete BIM Designers application, as a result of users demand for a more compact reinforcement package, that includes calculation, cage generation, drawings, reports and detailing, from a single set of tools. Another ribbon-related change involves the addition of the new category of structural modeling tools, used for verifying and correcting the analytical model of Revit projects and obtaining correct FEM results after exporting them into Advance Design. The new tools in the set are used for resetting manual adjustments of analytical models (Reset Analytical Models), automatically trimming/extending the extremities of close objects (Trim or Extend), stretching the closest extremities of selected elements to a reference point (Stretch to Node), or indicating elements that seem to be connected but from a calculation point of view are not (Detect Errors). Version 2018 also comes with two new modeling tools: Join & Unjoin Geometry, which automatically joins, unjoins or switches the join order of selected element categories, and Pipe insulation, which automatically assigns insulation to the systems based on parameters such as the outer or inner diameter, or assigns a specific value. 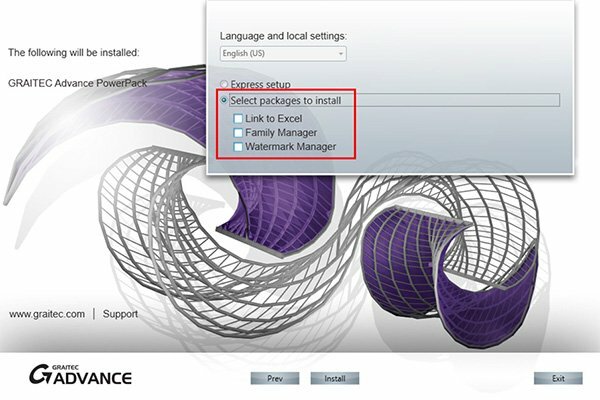 Other important improvements and news include the new interface in Russian, as well as the custom installation packages, which allow individual installation of certain PowerPack functionalities, such as Family manager, Link to Excel and Watermark Manager. A full overview of Revit PowerPack 2018 new functionality can be found in the PowerPack for Revit 2018 What's New document. Joseph Pais, GRAITEC Products Director adds: "We are constantly encouraged by the excellent feedback and productivity gains reported by Revit PowerPack users around the globe.